Sell My Galaxy Tab 4 | How Much is My Galaxy Tab 4 Worth? How Much is the Galaxy Tab 4 10.1 Worth? Sell your Galaxy Tab 4 10.1 for top dollar at GreenBuyback. Select the information above in order to receive an accurate quote for the Samsung Galaxy Tab 4 10.1 you want to sell. Click sell item if you agree with the price that is displayed. GreenBuyback purchases tablets at the highest prices in the industry! GreenBuyback pays cash for your old cell phones, tablets, and laptops. When you sell your tablet to GreenBuyback you will never have to pay to ship. GreenBuyback is dedicated to maximizing the cash back to our customers. 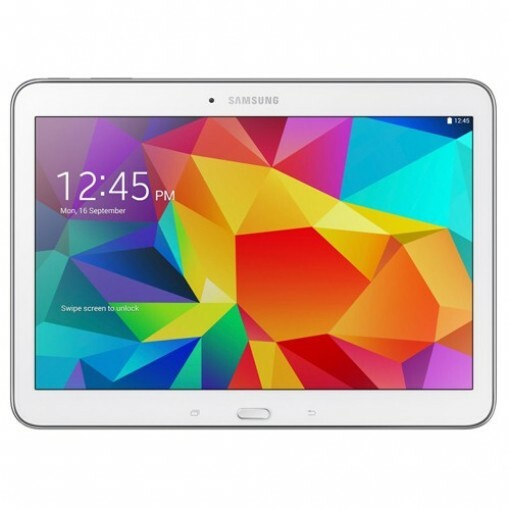 Sell your Galaxy Tab 4 10.1 for cash today! This, the fourth generation of the Galaxy Tab, is offered in three size choices: 10.1, 8, and 7 inches. The 10.1 has a front display entirely made of glass, and the back is plastic. At just over one pound, this tablet is ideal for travel or work. The display resolution is relatively low-res at 1280 x 800 pixels, however, the display colors are natural and vivid enough to look good. GreenBuyback will buy your Galaxy Tab 4 10.1 in any condition, even broken! Simply head to GreenBuyback to get a quote, send your Galaxy Tab 4 10.1 in, and get cash quick! The Galaxy Tab 4 10.1 features large stereo speakers on the left and right sides, making this a good tablet for playing music, as users won’t accidentally cover the speakers with their hands. Selling a Galaxy Tab 4 10.1 is so easy with GreenBuyback; just send your tablet to GreenBuyback with free shipping and you'll get cash sent to you fast!